In a survey of 1,655 MediCann patients conducted by Dr. Helen Nunberg in 2006, the majority reported using cannabis to treat pain (82.6%). Patients reporting use of cannabis for headache (40.8%) and muscle spasms (41.3%) demonstrate that cannabis is an effective pain reliever - one with an extremely safe profile. Cannabis is effective in treating a range of other physical problems such as insomnia (70.6%), anxiety relief (38.1%), improved appetite (38.0%) relief from nausea and vomiting - often associated with chemotherapy (27.7%), and depression (26.1%). One in four men reported using cannabis to help them improve their ability to focus. 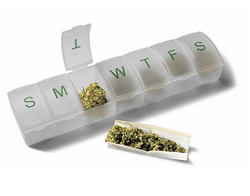 Half of the patients reported using cannabis as a safe and inexpensive alternative to prescription drugs. Cannabis has been used to alleviate the symptoms caused by numerous diseases and physical ailments. In addition to those already cited, cannabis therapy has been applied to the symptoms of diseases such as multiple sclerosis, AIDS/HIV, glaucoma, cancer and Alzheimer’s Disease. Hundreds of studies of the efficaciousness of cannabis are currently underway and undoubtedly more therapeutic uses for this remarkable natural medicine will be found.